Continuous Improvement for Business Success! This Continuous Improvement system – the Deming Cycle – has been implemented in the corporate world – originating in Japan in the 50’s. Why is this process so IMPORTANT Today? Stage 1 – Planning – this is the stage where you set the stage – you decide the end results that you are wanting – it helps to categorise these into – Financial, Marketing, Projects and Systems. This gives you a framework to move forward. The Important task with this stage is to set Key Performance Indicators. Set a measurement for each category to see that you are moving in the right direction. The time spent here is important for setting the stage for the improvements. To help small business owners who may be struggling, wanting more growth, looking for clients, using a system to work with helps. My approach is to do an audit using a marketing system – BookYourselfSolid® – by checking where the business is at the moment against the Internationally Successful Marketing system BookYourselfSolid® – you can find out what is being done at the moment and what needs to be done to grow. Stage 2 – Do – This is the execution step – You need to execute the actions required to achieve the goals you have set. This requires focus and a clear pathway of development – set in Stage 1. Keeping an eye on your Key Performance Indicators is important so see how you are tracking. For small business owners, The Speakers Practice approach is to train using the BookYourselfSolid® system – really getting a great understanding of this system will assist with developing skills using innovative approaches. This is where you go back and Check your progress – are you achieving everything you have desired or are you behind or infant? This is important to assess because its here that you make the decisions of what needs to be changed to achieve your end results – your Key Performance Indicators. Its may be you need some training, you need to learn new tasks, there will be some development required to grow your business to the next level. For small business owners – here another audit is done – to see how far the business has come – this is important in identifying the learning required to develop the skills of the owners and staff. This is where you do the learning, the training and grow the skills to enable you to develop your business further. Skills development is important whether you are a sole trader, a small business or a large multinational. The point with this process is that it is for any size business – growing and developing a business is essential for the health of the business – otherwise the business will stagnant. This is the training process – getting the business owner – out of their comfort zone – learning new skills which gives the opportunity to grow the business. The Speakers Practice offers presentation skills and public speaking training, speaking to camera training, creation of information products training, social media training, and so on. Then the key to this process is that it goes around and around. 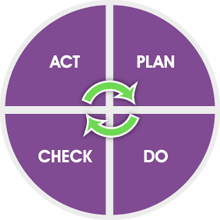 After the training – you do the planning , Implement and DO, Check and then do training to grow and develop more. Its about learning , growing , developing and achieving the seemingly impossible goals – with application , perseverance and using this four stage process – you can develop your business and realise your dreams. Next Next post: 51 Ways You can use Video to Promote Your Business!